Welcome aboard SANCTUARY! As the name denotes, this is your safe, serene and tranquil getaway on the water. 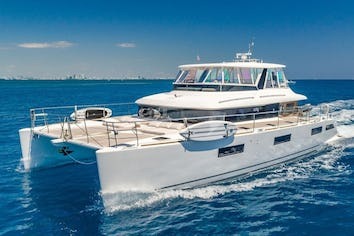 With her classic design and style, SANCTUARY offers a relaxed, welcoming and safe platform for family or adult charters. The large aft deck is an ideal place for Al fresco dining and the perfect vantage point for water sports or simply taking in a beautiful anchorage of your choice. 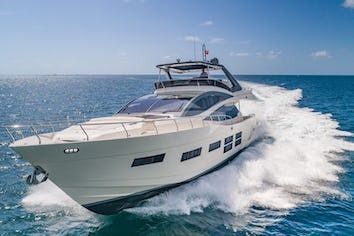 Her deck space is complimented by a forward sun pad and the raised flybridge, offering ample out door space for reading a great book, enjoying the Chef's culinary delights and beautiful sunsets. The open Salon and Dining area create a cozy space for guest while still enjoying the scenic views through her large windows. 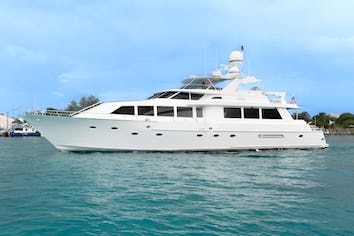 Below deck her four guests cabins are accessed via a large open foyer. Warm woods with regal navy and bright white accents create a sophisticated and comfortable area for guests. The large, full beam, Master cabin can be adjoined to the Twin stateroom making it an ideal space for families or a single couple looking to spread out between the two cabins. Her large VIP cabin with Queen bed has a large ensuite with double sinks and a large shower. The Twin cabin to port has two large Twin beds and ensuite. To starboard is the single twin with pull-man and ensuite that can be opened or closed off from the Master cabin. With all the comforts of home balanced with all the opulence a yacht charter has to offer, SANCTUARY is the perfect fit for your next getaway!